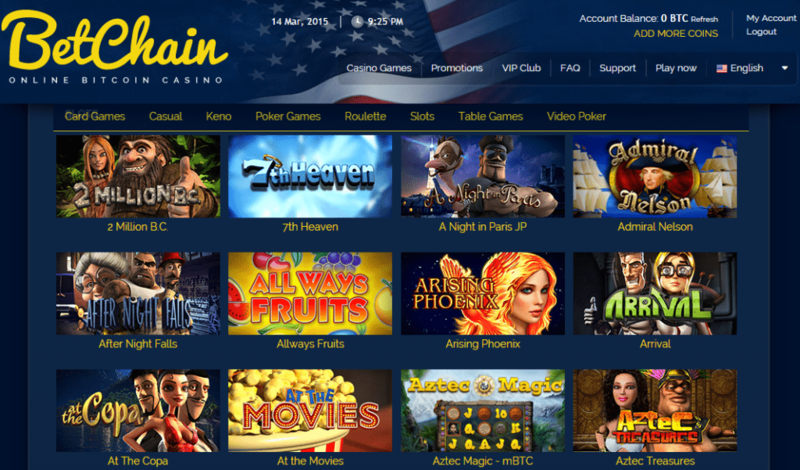 Betchain Casino is an online Bitcoin casino where players can place bets using the popular Bitcoin currency. This site was launched in 2014 and it has quickly become a well known name in the gambling industry. There are many reasons why Betchain Casino is such an attractive online gambling destination. For example, the casino offers games by well known providers such as SoftSwiss and BetSoft. Additionally, Betchain has good promotions and even better VIP program. 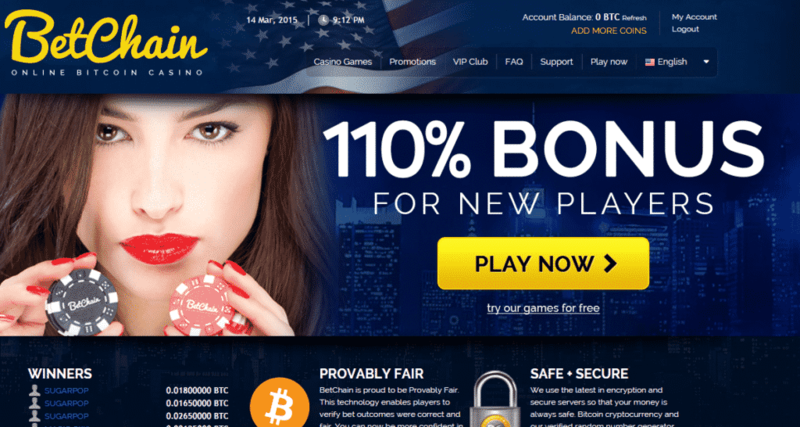 Betchain Casino is also 100% safe and fair, plus it guarantees anonymity to its customers. All of these things make Betchain Casino a desired gambling site which is regularly visited by a large number of players. Betchain Casino features over 60 high quality Bitcoin casino games that can be played instantly in both fun mode and real money mode. All the games run smoothly and the overall playing experience is always pleasant. Betchain Casino has seven main game categories and some of them hide many titles, whereas others are pretty poor. Card Games – The card game category offers eight titles out of which six are blackjack variants and the rest are Baccarat and Hi-Lo Switch. Casual – Minesweeper is the only casual game at Betchain Casino, but it is very fun and exciting. Poker – Six thrilling poker games such as Trey Poker, Casino Hold’em and Caribbean Poker are waiting for players at this Bitcoin casino. 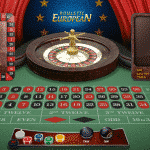 Roulette – Roulette fans have everything they need at Betchain Casino since the site offers the four most popular roulette games: European Roulette, American Roulette, French Roulette and Roulette Royale. 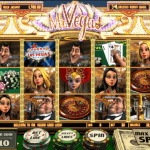 Slots -This site uses games by three leading providers: SoftSwiss, BetSoft and Amatic Industries. The biggest number of games (44) is found in the slot games category and some of the attractive titles are West Town, Desert Treasure, Admiral Nelson, Brave Viking and Eye of Ra. 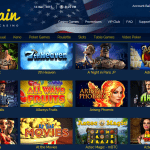 Video poker – Four video pokers, including Jacks or Better and Wild Texas, are on the menu at Betchain Casino. Betchain Casino thinks on everyone and hence it has added several HTML5 games which can be played on smartphones and tablets. Players simply have to visit Betchain Casino using their mobile device and choose one of the offered games. The supported mobile operating systems that can access Betchain Casino’s mobile games are iOS and Android. 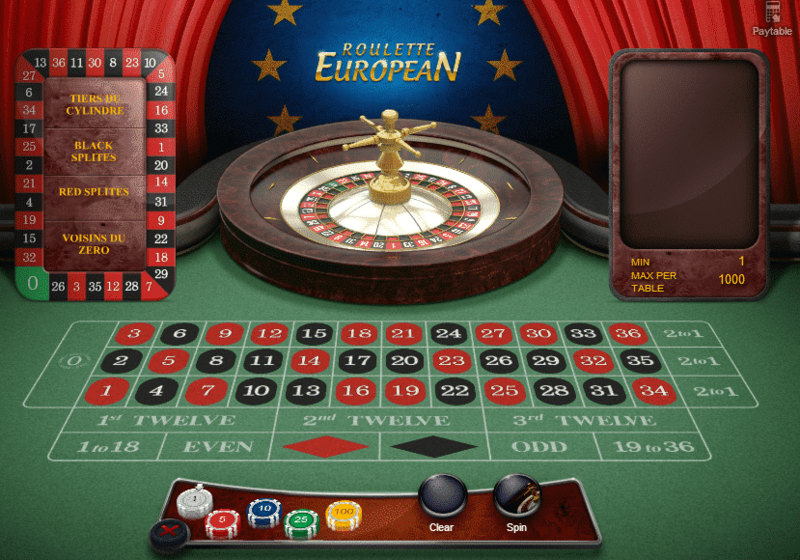 The game offer features 8 Bitcoin slots, Bitcoin table games such as Blackjack and Baccarat as well as two video pokers. 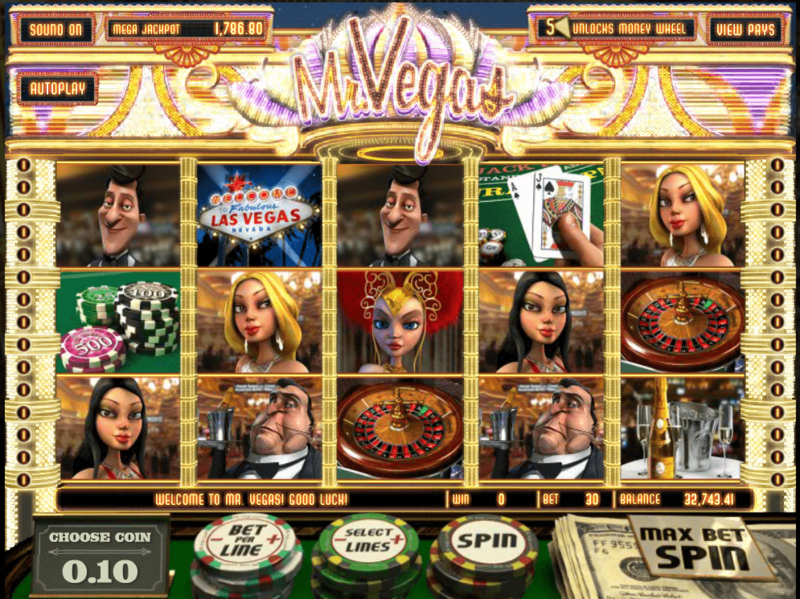 The latest games to be included in the offer are Brave Viking and West Town Slot. Betchain Casino is a very generous gambling site that has bonus offers for all types of players. Additionally, it has a well developed VIP scheme that offers many benefits to those who will become part of it. 1. 110% first deposit bonus – Newly registered members get a massive 110% match bonus after they make their first deposit at the casino. The maximum bonus amount is 0.5 BTC and the minimum wagering requirements are 40 times the bonus amount. 2. Highroller Bonus – Highrollers are more than welcome at Betchain Casino and therefore the site has a special welcome offer for those who will make a first deposit between 1 BTC and 3 BTC. The bonus is 100% and the wagering requirements are 20 times deposit + bonus amount. 3. Slots Bonus – Those who are into playing slots and hope to hit a massive jackpot can decide to claim the exclusive welcome offer called Slots Bonus. Slots fans get a 300% first deposit bonus up to 0.1 BTC whose minimum wagering requirements are 50 times deposit + bonus amount. Betchain Casino has a well developed VIP program and in order to become part of it players have to write an e-mail to the customer support service. Once they become VIPs, players get a better comp points conversion rate, exclusive bonus offers and a dedicated VIP account manager. Additionally, Betchain Casino organises special event and tournaments in which only VIPs can take part. All of the games at Betchain Casino are provably fair. Each game features a purple tab and whenever players click on it they can check the hash string. In-depth explanation about how provably fair games work players can find on Betchain Casino’s website and they also can learn more about provably fair slots, roulette and card games. The customer support service at Betchain Casino works 24 hours a day, seven days a week. Users and visitors can use the contact form in order to ask for assistance at any given time of the day. Unfortunately, there are no other contact options such as live chat or phone. Betchain Casino is available in English, German and Spanish. Even though Betchain Casino exists for less than a year, it is definitely a Bitcoin gambling site that has to be experienced. The casino is very generous and welcomes players with mouth watering offers, plus it regularly surprises its loyal users. Furthermore, Betchain Casino is provably fair and it features over 60 top notch quality casino games supplied by leading providers. Finally, the site is also available to players who enjoy gaming on mobile devices and hence there is not a single reason why somebody should avoid this excellent Bitcoin casino.